One of the best things about spring is all the beautiful blooms and flowers it brings. Spring also brings one of my favorite holidays, Easter. While most people do not include Easter as one of their top holidays, to me it’s a sign of new beginnings, a transition from the cold of winter to the warmth of a new season. It’s also, typically, the first holiday we get to spend some time outdoors with our family when we get together to enjoy our Easter feast. Along with Easter egg hunts, Easter baskets for the kids and our closest friends, I have always loved giving and receiving plants or flowers as an Easter gift. My mom and mother-in-law receive the traditional Easter lily while others enjoy a potted plant or blooming bulbs that can later be transplanted in the garden. There are numerous plants and flowers that bloom in Spring, but below you will find details on some of the most common plants that not only make beautiful gifts at Easter but also symbolize the Easter holiday. Some of the most common flowers that are given as gifts at Easter are delicate flowers that should typically be grown only indoors as houseplants. 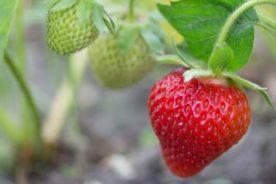 There are a few varieties of these plants that can be grown outdoors but only in the warmest areas of the country, especially hardiness zones 9 and 10. Usually the plants below are found growing individually in a pot, but they also make great options for a beautiful cut flower arrangement. Easter lilies are perhaps the most symbolic flower of Easter. So popular, in fact, that most Catholic churches blanket their sanctuaries with these decorative blooms as a symbol of the purity and divinity of Jesus. The singe flower that stems and blooms from a single bulb is also a representation of Jesus’ resurrection. 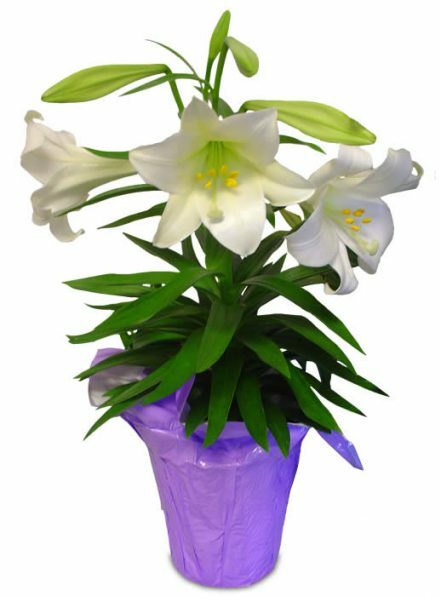 This type of lily is always white and can be found in pots in almost any retail store as they make a popular gift for the host of Easter dinner. Foliage is a dark green color and the bloom looks like a white trumpet. Since these flowers are forced to bloom in greenhouses just to sell during this season, they are not typically replanted for regrowth except in tropical regions. Calla lilies are an elegant flower that are commonly associated with weddings and formal celebrations. 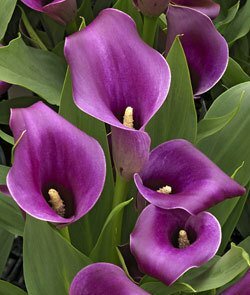 While they can be grown outdoors in warmer climates, calla lily plants thrive best in containers either indoors or outdoors only during later spring or summer when the chance of frost has passed. They thrive in sun, well-drained soil, and like to be kept watered. 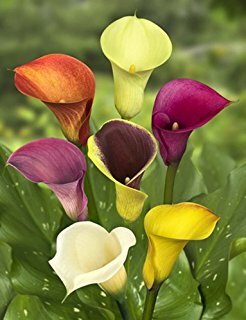 Considered a romantic flower, calla lilies can commonly be found at Easter in vases or cut flower arrangements. 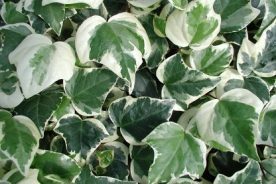 Their foliage consists of luxurious, shiny green leaves and a long sturdy green stem. Blooms come in a variety of colors and are a single cup-shaped petal at the end of the stem. 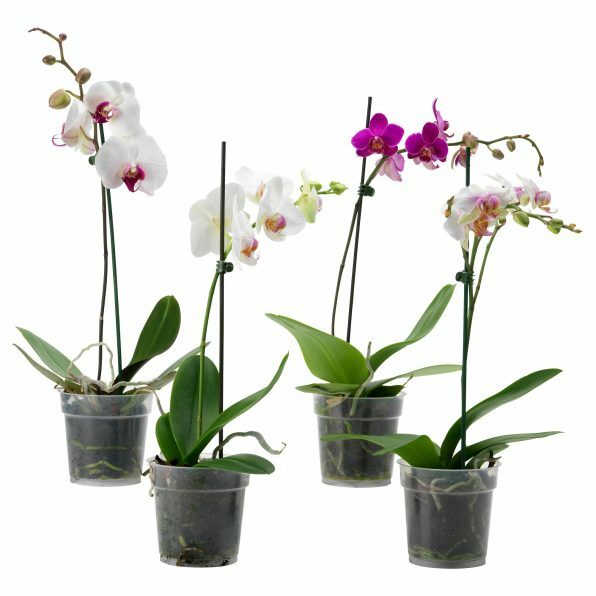 Orchids, one of my favorites, are most common as a houseplant because of their delicate nature and sensitivity to light and temperature. They have a reputation for being difficult to grow but they can actually be very low maintenance as long as a few simple growing tips are followed. This includes leaving them planted in a material with high drainage such as bark or moss instead of soil. They only require watering every 7-10 days and should only be watered once their planting medium appears dry. They do require light but not direct sunlight and they do not appreciate being re-potted. These attractive houseplants typically have green or a gold colored foliage. They have large leaves that grow from 6-12 inches long with a long stem on which the colorful blooms grow at the end. Blooms comes in a large variety of colors and are split into 3 or 4 petals. The weight of the blooms and thinness of their stem usually requires these flowers to be attached to a stem support to stay upright. 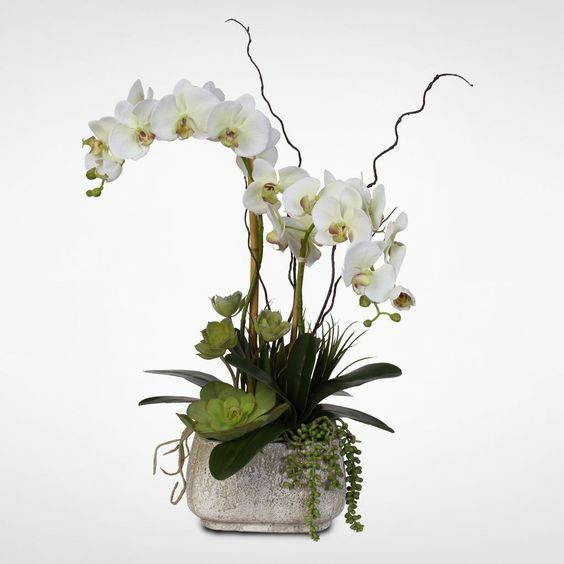 Easter symbol: Orchids do not carry a definitive Christian Easter symbol, but overall as a gift they symbolize love, strength, and beauty. 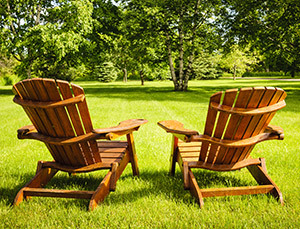 Many outdoor plants that are indicative of Spring have naturally become great Easter gifts since the two events occur at about the same time. While I don’t have the privilege of having any of these flowering bulbs in my own garden just yet, I remember as a kid always watching and waiting for them to bloom at my parent’s house. My mom’s excitement for the tulips and daffodils in her flower beds was infectious and we always ended up with beautiful cut flowers for our Easter dinner table. These outdoor Easter plants can be found readily in pots in many garden stores at the beginning of Spring where they were probably forced to bloom in a greenhouse. 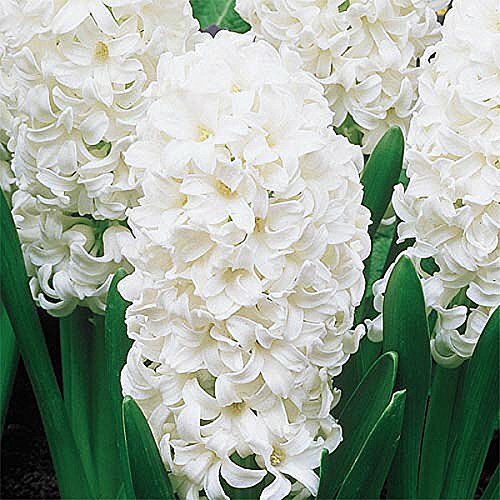 However, these bulbs can easily be transplanted into your own garden for the remainder of spring and summer. If cared for correctly during the cold months they will provide a colorful display to anticipate each year. Daffodils have become a tell-tale sign of Spring even in some of the colder climates of the country. They are a fairly hardy flower with a long life and cheery blooms that sometimes even appear in the snow. 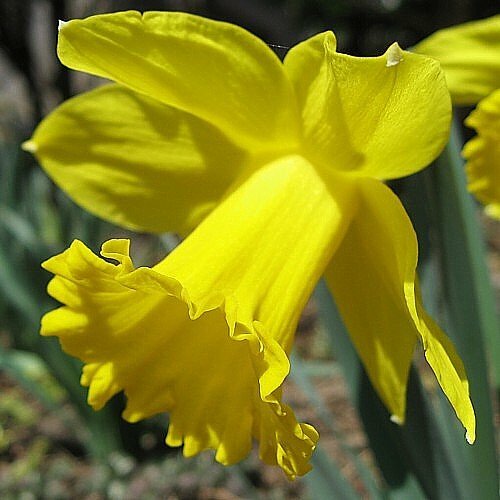 A daffodil bulb with thrive best in a climate that has a cold winter so they get a chill before blooming in the spring. If you receive daffodils as a gift in a pot you can easily replant the bulbs in the fall so they come back to the garden the next spring season. As an Easter flower, daffodils are very popular as cut arrangements in vases and can be purchased by the bundles at flower shops and many retail locations. Their foliage is a bright green and blooms are stereotypically yellow but other varieties can be white or have orange-colored centers. They commonly represent new beginnings and rebirth and have also become a symbol of happiness and hope for the American Cancer Society. Tulips have a simple beauty and have become a classic flower of Easter. 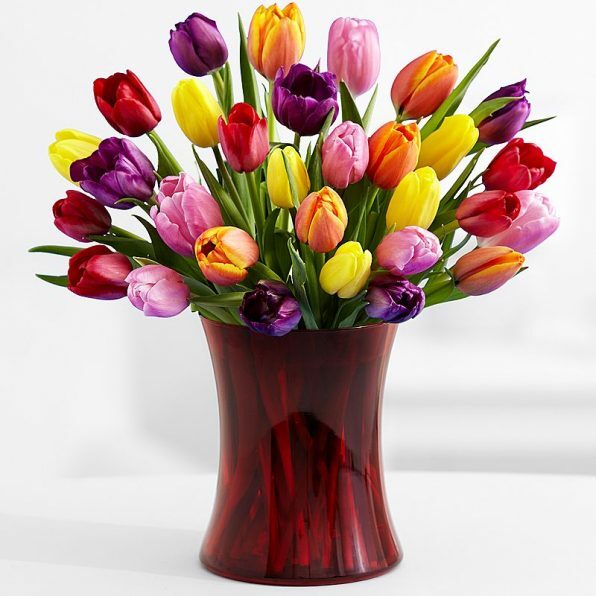 While they look great in a cut bouquet, tulips are more commonly given as gifts in the form of a potted plant because their bulbs can be replanted after the risk of frost has passed. 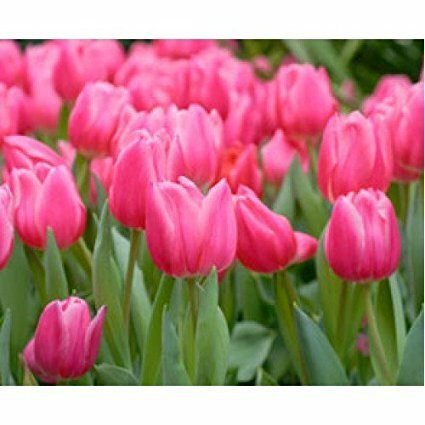 Tulips will grow best in a garden if they are dug up after they’ve finished blooming and then replanted in the fall. There are more than 150 varieties of tulips and they come in every color of the rainbow. Variegated tulips have blooms in two colors that can be swirled together or one color faded into the next. 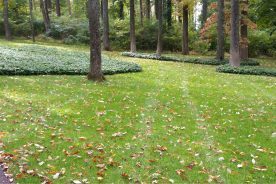 The foliage is green with a long hollow stem and tulip bulbs are a recognizable cup shape. Each of their colors can hold a special meaning but at Easter the most common are white for forgiveness and purple for royalty. Tulips are readily used in Dutch communities to celebrate their heritage. Hyacinths are a very popular flower of Easter arrangement and bouquets. In order to be ready for Easter most are forced to bloom in greenhouses. They can be grown in gardens, especially zones 3-8, but may not always be ready to bloom by Easter. 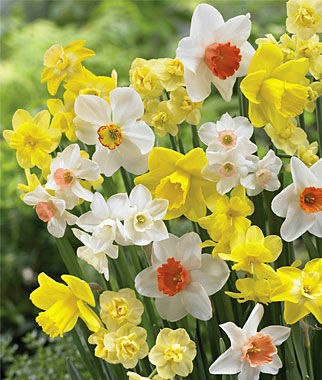 Their bulbs should be planted in fall before the first frost in order to have colorful blooms in early to mid-spring. These attractive flowers come in a variety of colors, commonly white, pink, purple, and blue. Their foliage is a fat leaf comparable to a succulent. Flowers grow in a tight cluster around a central spike, forming almost a brush-like shape. Most varieties grow only about 8 – 12 inches tall and make a great groundcover in flower gardens. 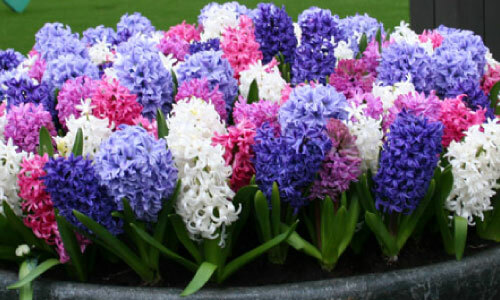 Hyacinths are commonly recognized for their perfume-like fragrance. Of course, there are lots of other beautiful flowers that others may relate to spring and the Easter holiday, these are just a few of my favorites and those that show up most often in my home or the homes of my loved ones. When looking for Easter gifts keep in mind that bulbs can be replanted and enjoyed for many years to come, however fresh cut flowers can add beauty and fragrance to any table. Look at many of your favorite places to shop and even online for the perfect floral Easter gift for a loved one or even for yourself.